This year, the NNA is celebrating important anniversaries of two groundbreaking resources for Notaries: The Notary Public Code of Professional Responsibility and the Uniform Notary Act. First published 15 years ago — in 1998 — theCode serves as a guide for Notaries Public when statutes, regulations and official directives fall short. Many organizations and businesses rely on the Code as a standard for their staff Notaries, and in 2008 then-Hawaii Attorney General Mark Bennett enacted it as a set of administrative rules all the state's Notaries must follow. Drafted with the assistance of Yale Law School, the Uniform Notary Act of 1973 is celebrating its 40th anniversary this year. It was conceived as a piece of model legislation for state legislators to use to update their respective Notary statutes. 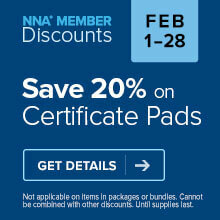 Its groundbreaking provisions included a requirement to keep a journal of notarial acts. 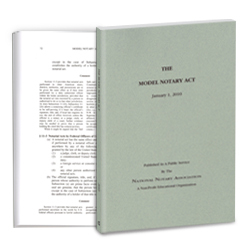 The Act was revised as the Model Notary Act in 1984, 2002 and 2010, and now includes such elements as Notary education and detailed provisions for electronic notarizations. More than 40 states and jurisdictions have adopted at least some part of the Uniform and Model acts, with many establishing journal requirements and mandatory Notary education. It also has been cited in numerous court cases over the years.